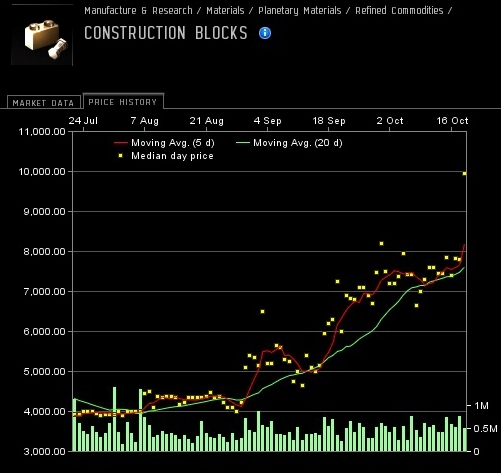 I’m a creator at heart and now that we have gotten back into sovereign nullsec, I want to setup a research POS. Working with eve.1019.net’s POS planner, I setup a tower with six Advanced Mobile Laboratories to estimate fuel costs. Two major events are increasing the cost to run a POS. 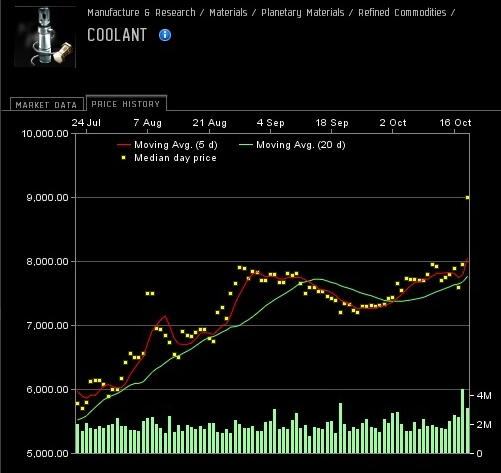 GoonSwarm’s Gallente Ice Interdiction campaign has driven up prices for not just Oxygen Isotopes. 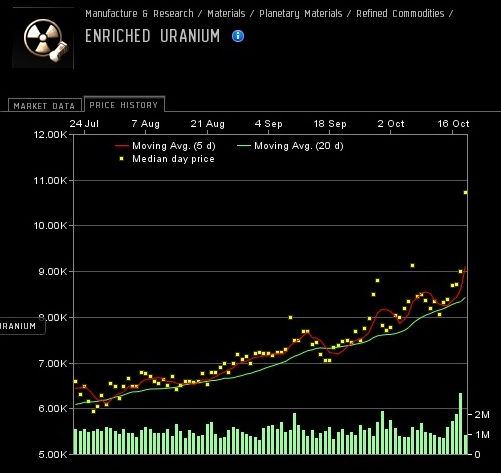 All Isotope prices have gone up due to market speculation and general Mackinaw killing campaigns. 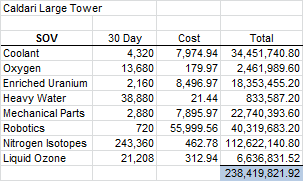 Gallente towers are used for moon harvesting due to their bonus 100% bonus to Silo Cargo Capacity values. 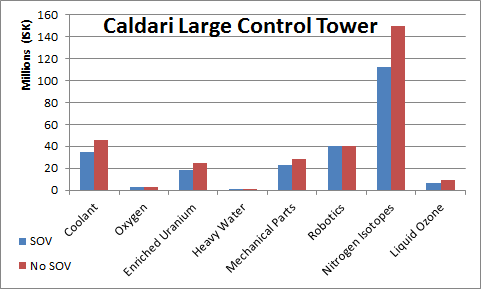 Since I will not be moon mining, I picked a Caldari tower which uses Nitrogen Isotopes. 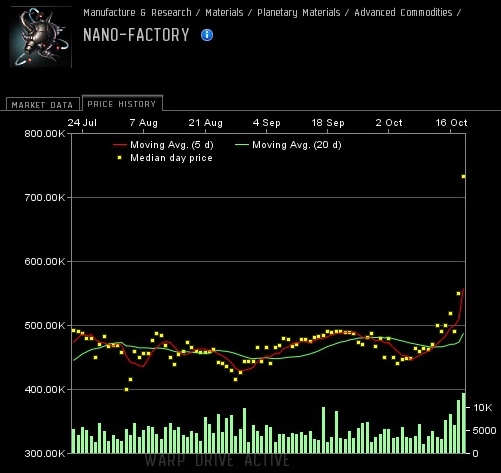 Additionally the announcement of Player Control Customs Offices in the Winter Expansion has caused all PI products to rise in price due to market speculation. 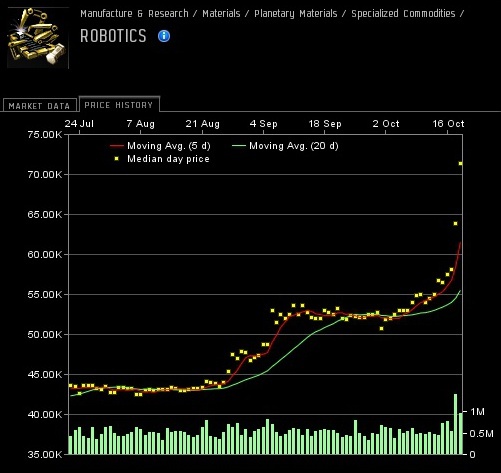 Practically every PI item has been affected with precious Robotics taking a hard hit. With Isotopes consuming a large amount of the ISK to run the tower, any ice mining that we do as a corp will help bring down the costs. Faction towers do have lower fuel requirements than Racial ones. 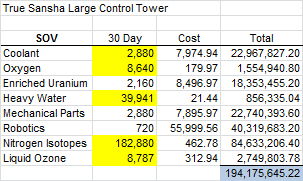 Putting the same 6 labs on a True Sansha Control Tower shows a 44.2 M/month savings on fuel. 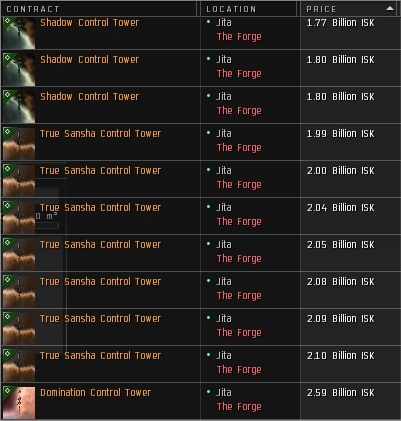 Sadly the high price of the faction towers means that it will take 3.5 years to make up the cost difference using the lower prices True Sansha variant at 1.99 B ISK. Another iteration of PI is coming to the server. The existing Office structures in orbit around planets in lowsec, nullsec, and wormhole space will disappear. Players will have to build their own player-controlled Offices in order to move PI items on and off of planets. Note: Highsec will not be affected. For 6,000 Concord LPs and 20 M ISK, you can get one Customs Office Gantry BPC. Interesting move that the BPO will not be released. This means that people will have to continually engage in Concord LP activities such as Incursions or Faction Warfare. Jester went into detail about the gameplay changes due to the hit point values, reinforcement timer options, and LP requirements, but I wanted to cover the market aspects of the changes. You might be able to make a lot of money off of the changes. When PI was first introduced, I was able to turn 2 B into around 5 B by playing the speculation game. Disclaimer: Everything I say and quote could be entirely wrong so do your own research. 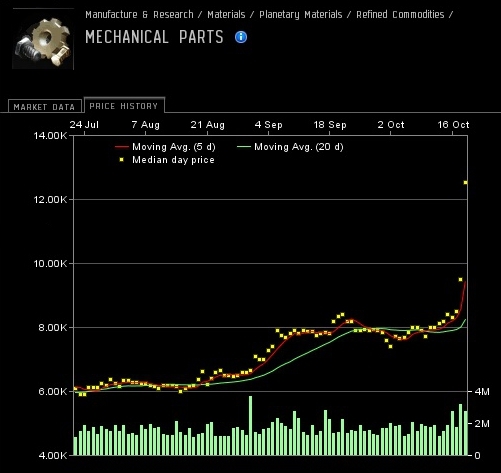 As soon as the devblog was posted, the market speculators began to buy up the component items. 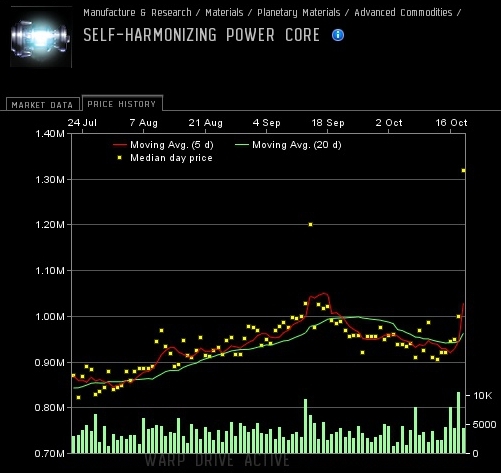 The consensus is that when this goes live all existing PI in lowsec, nullsec, and wormhole space will be affected. There is going to be a delay to get the new Customs Offices in place because people will have to obtain a BPC from the Concord office, build the Gantries, and anchor them in place. Additionally, there will be a wave of people that will consider this effort to high and give up on their existing PI production. Prices for the parts that made the Gantries, items for POS fuel, and T2 production are going to increase. If you want some hard speculation numbers, a 40-60% increase short-term in the first few months and a general 20% increase over the long-term seems reasonable to me. Take a look at the speculators in action in The Forge. Now is not a good time to have to buy POS fuel. I hope you have 6 months to a year in reserve! 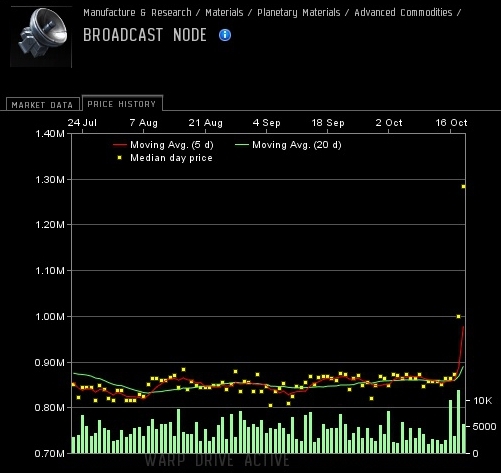 With the fall of Imperial Order, we lost our space in nullsec. After the evacuation operations finished up, we found ourselves enjoying Empire space for a few weeks. We consolidated assets, ran some Incursions, and explored a few wormholes. Now we are bored. Due to our lack of direction, we have started to lose people. 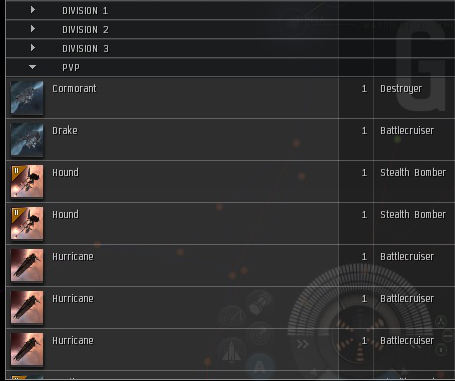 A lot of our members were with us for nullsec access and since we have lost that arena, people have moved on. I don’t blame them; I would have also left if it weren’t for the bonds I have with my fellow corp members. I have been flying with this group of people since early 2010 and over time, it has become my home. Additionally, around a month ago, a rather big event took place for us. For reasons that I would rather not like to discuss, the accounts of our former CEO were banned from Eve. 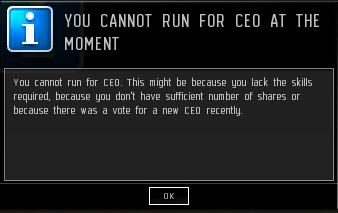 His characters and our current inactive CEO hold all the shares so we can’t request a vote for a new CEO. We are in a position where the three currently active directors can’t take over the CEO role and provide leadership for the corporation. A petition to get the shares redistributed resulted in a message back from a GM that “we would like to return the shares, but your current CEO is still active”, which is true. He just isn’t logging in due to real life commitments. We’re stuck and I feel that it is my time to make a run for the CEO title and enact some change with the help of the other two active directors. Since we can’t get the CEO role in our current corporation, we are planning on forming a new corporation. We also have been working the diplomatic channels and we might have an in with a current nullsec alliance. Though one person will have the title on the corporation dashboard, the three active directors are going to share the CEO power 33-33-33%. We believe that this will help reduce burnout and provide nice US/UK timezone coverage as two of us are US based and the other UK based. Step 1, secure existing corp money and assets. 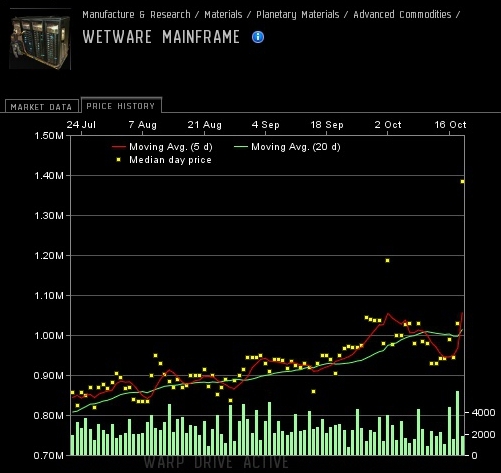 I took out the leftover money in the corp wallets which netted me about 4.2B ISK. This will be used to buy POS equipment for our eventual move to nullsec, alliance fees, some fuel for the Jump Freighters, and basic PVP equipment. I also found some ships sitting in one of our corp offices that I made sure to secure. 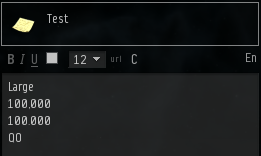 Having these on hand to offer out as free PVP ships will encourage people to move out to nullsec quickly. Step 2, hold corp meeting. We will be proposing our idea to the group for feedback. We’re not sure at this point how our plan is going to come together, or even if it will. Perhaps this will be a new age for our corporation or perhaps we will all go our separate ways. According to a CCP responce on the Eve forums, we now know that Establishment will not be included in the Winter expansion. Sadly, the Establishments feature will not be coming in the winter expansion. We hear you guys loud and clear and realize that there is still strong support for a multiplayer, avatar based experience in EVE (we also hear those that don’t want it). However, we think you’ll agree that it has to be a compelling experience and there was a feeling amongst our people that the direction we were taking with the Establishments feature was… well, not that fun. Additionally, we wanted to ensure that our rendering technology was finely tuned to a point that would ensure all of your characters continued to look great while performing well. It’s humbling to see the support in this thread for a multiplayer Incarna experience and we are still committed to providing it, as and when it’s ready. We want to take the time to do it right and ensure you guys get something that is both fun and involving. There are no promises about when this will happen, just rest assured that while you are enjoying your space based updates this winter, there will continue to be movement on this. 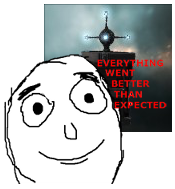 I’m completely fine with that as I agree with CCP Solomon’s statement. The current Incarna engine lacks the complexity and efficiency to properly render an area with multiple characters. Try running three Captain’s Quarters at once. Even on my semi-modern GTX260, it is unplayable. 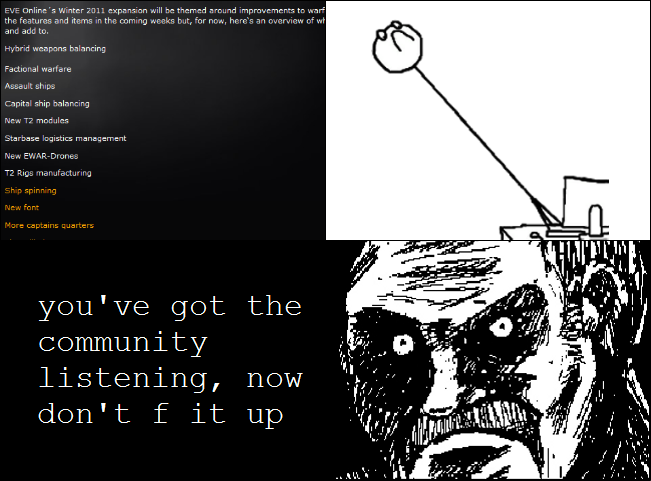 I don’t understand why CCP chooses to reinvent the wheel. The Incarna engine and the impending delivery of the new font are examples of code that could be licensed and used from other sources. I would have picked a proven engine such as the id Tech x or Unreal for my own needs, but hey, perhaps it was more cost effective to build it in-house (I won’t begin the World of Darkness discussion). Given that we are forging ahead with the current engine, improvements will be needed. 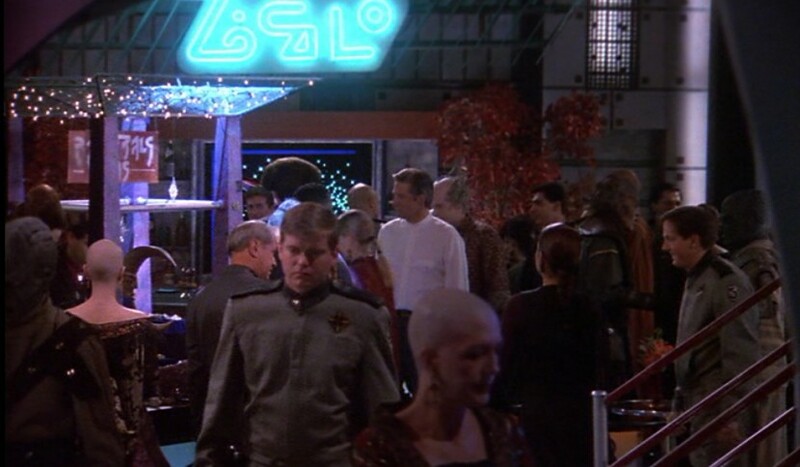 The design for the common areas should be modeled after iconic arenas that we have seen in modern Science Fiction shows; the Babylon 5 Zocalo and the Deep Space 9 Promenade are leading examples of the services, density, chaos, and intrigue that a public space should bring to the game experience. There are going to have to be some smart designers implementing this vision. How are they going to design a space where the population of Jita can interact in a common public area? I can’t fathom right now. Is there going to be a hallway with 1,200 doors — one for every person docked? What if there are two floors and 100 people are moving between them all at once? Engaging social and technical problems. I can’t wait to see some concept art and blogs about this idea. I am fully willing to wait 1-2 years for a finished public space to hit the server if we can work through such laundry lists as the ones proposed for the Winter expansion. For further commentary see the Jester’s Trek post on Establishments. Glorious, stupendous! There is a new font in the development pipeline. Grey Stormshadow has a excellent post with a screenshot summary of the current issues. Kerning and Tracking! Take a look at how the ‘La’ for Large merge into one character. (Personal preference) Use a horizontal bar in the the zero character and not a diagonal one. I’m finding that looking at 100,000 to be very distracting when you have multiple rows of zeros.